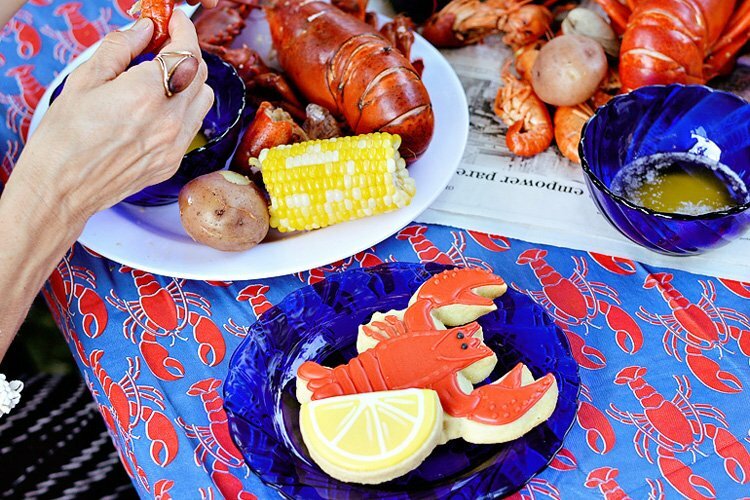 Alison of The English Pea Studio hosted a wonderfully modern, Americana style Low Country Boil Party earlier this year, and it’s absolutely bubbling over with creative details. 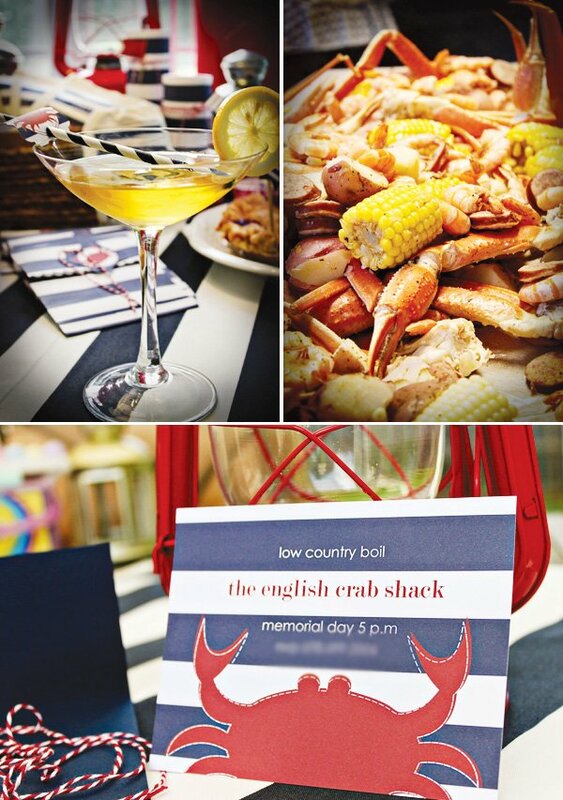 While nautical designs & colors naturally lend themselves to patriotic celebrations (like this one, held on Memorial Day), crab feasts really are a fun way to ring in any warm summer day! Memorial day always seems to be our kick off to summer around our house and celebrating with a low country boil seemed the right way to ring it in. 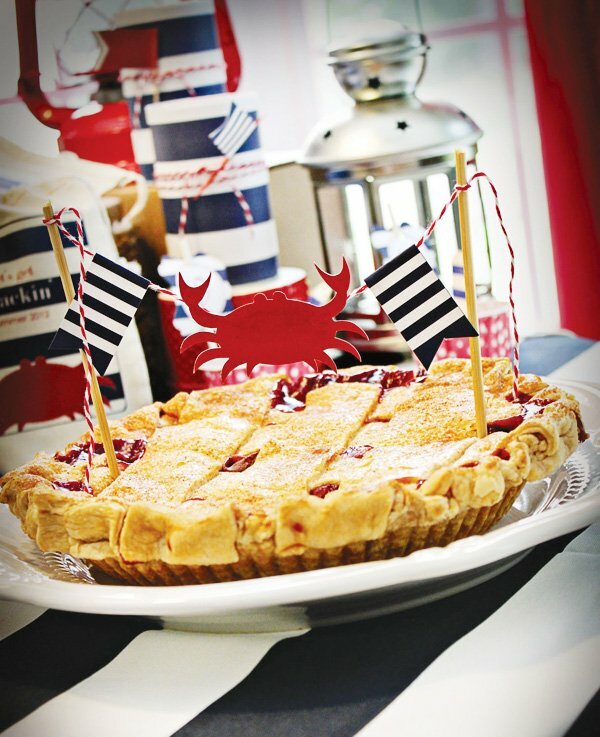 My whole inspiration revolved around a nautical theme with Americana details – from wide navy stripes, to the perfect crab motif, to a classic cherry pie – fun was had by all. I chose a wide navy stripe to set off the table to mimic the stripes used throughout the theme. 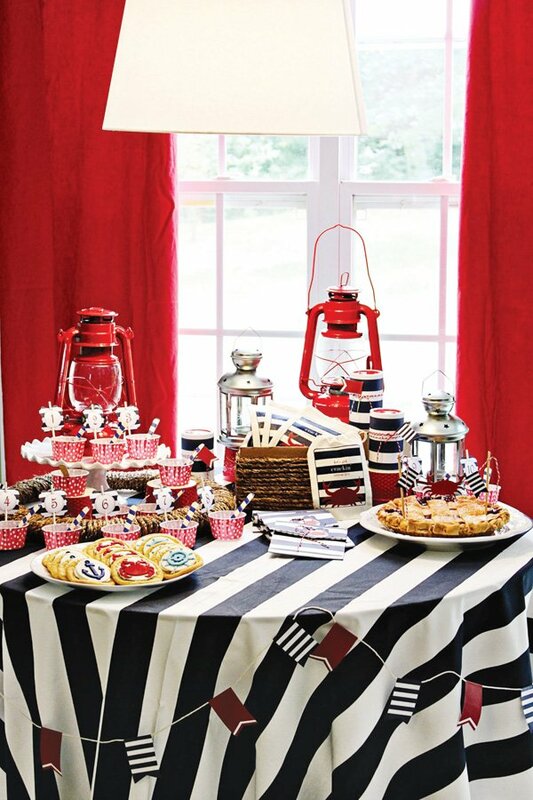 Nothing says nautical and Americana to me like flags and there were plenty used throughout – from the cherries used in the ice cream bar to adorning the party favors – we were flying our flags high! I chose a variety of shrimp, corn on the cob, red potatoes, crab legs, and sausage as our low country boil fare, with the traditional Old Bay Creole seasoning used to season our feast. The food was served in true low country boil style – cooked together, laid out together in a spread and consumed together. 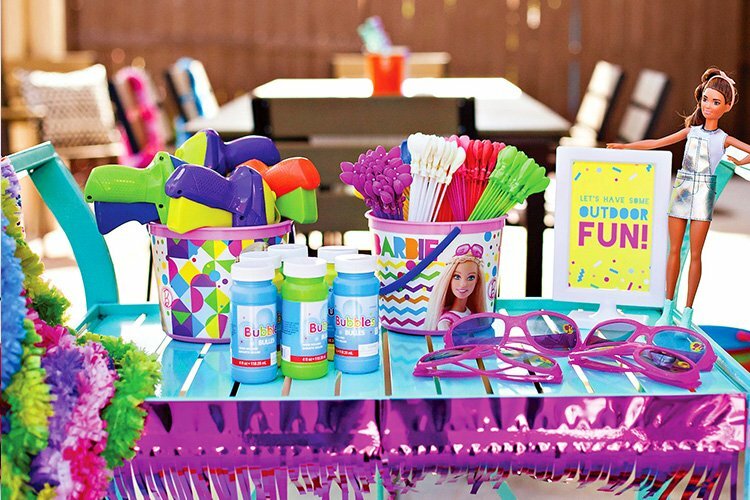 Guests sipped on their favorite beer, red cool aid (for the kiddos), or an alcoholic Arnold Palmer – a mix of sweet tea flavored vodka and lemonade. 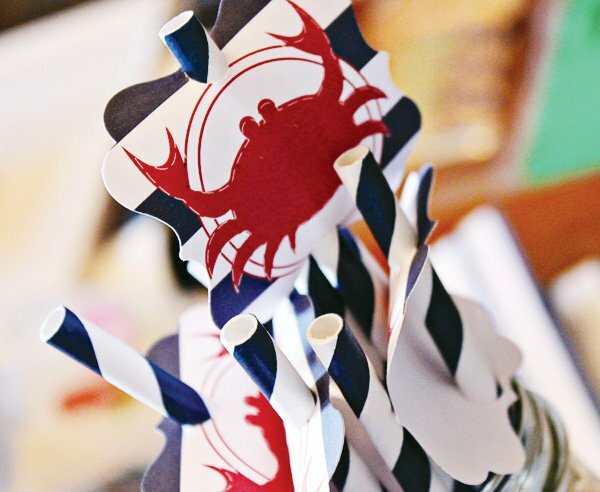 Even the beverages were not forgotten in the décor with navy striped straws and crab tags. 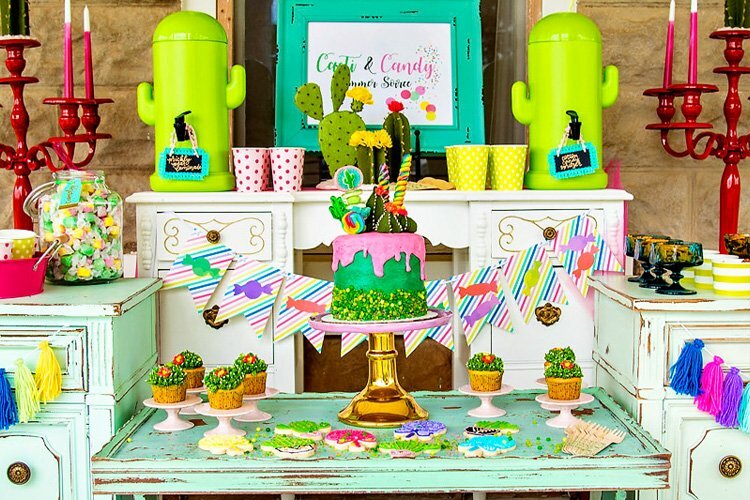 Desserts were both traditional and fun – paying homage to our American roots. 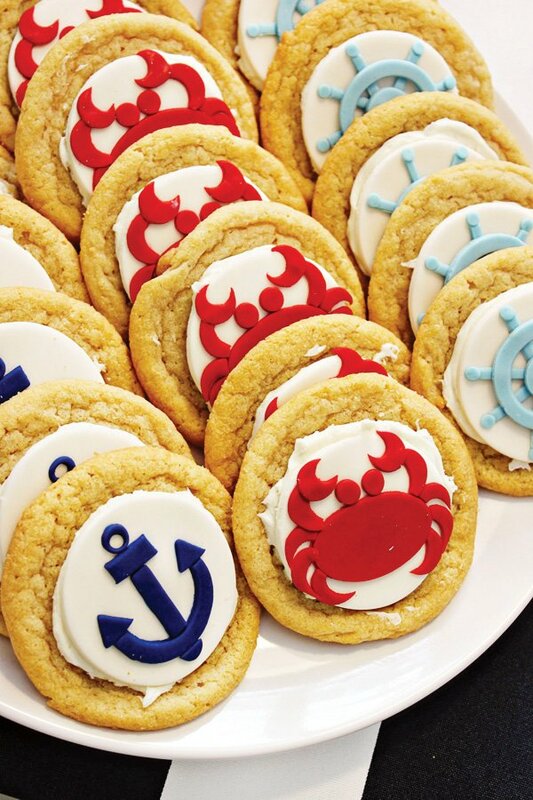 Custom anchor, crab, and ships helm fondant toppers were used on regular sugar cookies and an ice cream bar was set up for the kids. Both the nautical and Americana theme were carried through with each ice cream cup created to look like a little ship with their navy, striped spoon as the oar. Each child was able to pick out their number in the “fleet” of ships and various toppings were available to personalize their creation. The adults enjoyed a traditional cherry pie with a beautiful lattice work crust – which was simply adorned with a small flag/crab topper. Guests topped off their pie with a generous helping of vanilla ice cream, whipped cream and a cherry on top. The details were not forgotten in the favors. Each child took home cookies which were held in a wide striped paper bag. The bags were tied off with a string of red and white twine and a crab gift tag. The edge of each bag was scalloped to mimic the look of waves. 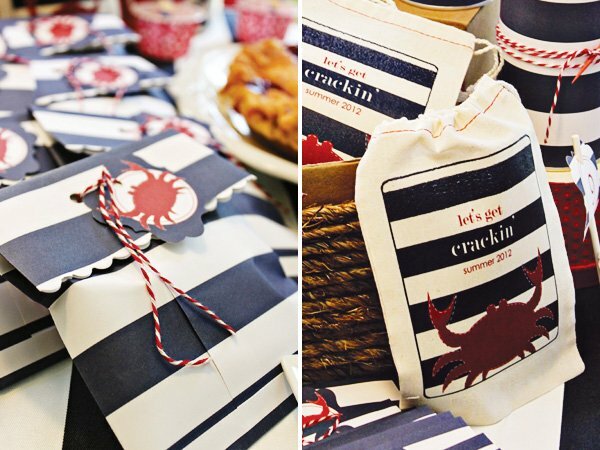 The parents left with a white, muslin bag that coordinated with theme that said” Let’s Get Crackin’ Summer 2012.” Each bag contained a container of Creole seasoning for each family to use throughout their summer. 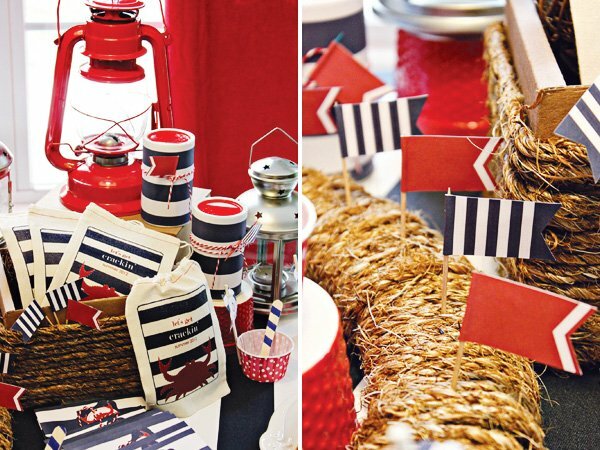 These containers were also decorated to reflect the overall design – with a wide striped navy paper, red and white twine, and those wonderful flags. It was a wonderfully laid back evening full of good conversation, wonderful food, and great fun! Darling! I love everything nautical. 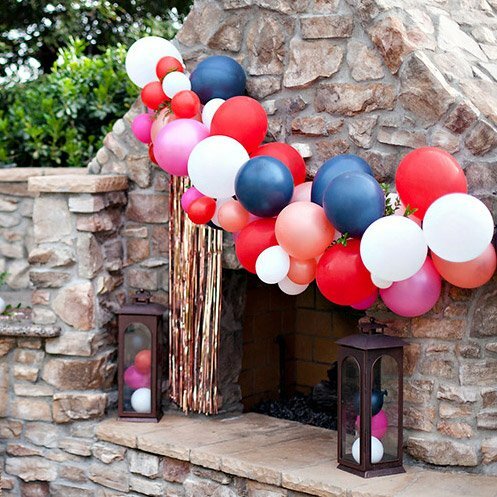 I recently hosted an end of summer nautical dinner party. 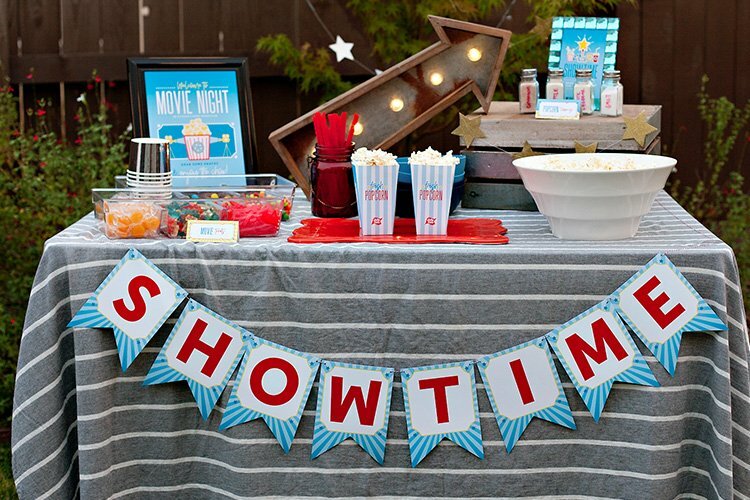 Wish I would have thought to include those adorable lanterns! Perfection! That top photo of the crab and corn has me soooo hungry. Is it lunchtime yet? Please? Wow! The nautical theme is awesome! Great theme choice. Great way to compliment the Summer, even though we haven’t had the best summer lol. Alison did an amazing job! Such creative and beautiful ideas! It was an absolute pleasure working with her to create the fondant toppers for the cookies.